For the first time in forever, HP has birthed a new line and brand of printers – well, sort of. A couple of years go, HP introduced the OfficeJet Pro X line of printers. These printers looked a lot like a LaserJet printer, they were built for business, but the actual print tech was more closely related to an inkjet, and so they were placed in the OfficeJet line. But, there was so much different than other OfficeJet printers. These printers didn’t use a moving print head, they didn’t use the same type of ink and the print speeds were much faster than any other inkjet. This was all enabled because of a print bar that spanned the entire width of the page – something HP dubbed PageWide Technology – and pigmented ink. So, HP sent me one of the new PageWide Pro 577dw for a test drive. I was lucky to test the OfficeJet Pro X 576dw a couple years ago, so the model I was shipped allowed me to compare the two head to head and see where HP has made some improvements. I wanted to compare the same print jobs head to head on these two printers and clock the differences between them. Those results are near the end, but first, take a look at how the PageWide Pro 557dw is equipped. 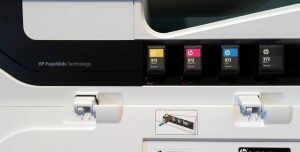 For the 500 series, ink has been relocated into the previously empty space below the output tray — but the PageWide 300 and 400 series are configured like the OfficeJet Pro X 577dw. Pro X was rated at 42ppm and the PageWidePro is rated at up to 50 ppm in Professional mode – general office is also faster and the output tray has been redesigned slightly to handle increased speeds – my tests saw better than these advertised speeds, if you deduct the time for the first page to print. Overall the printer firmware is a big improvement over the previous generation. The touch screen seems to be much improved and the ability to move and customize the display is great. There are also new app additions to the onboard software. Many of the great features of the OfficeJet Pro X made their way on the PageWide Pro including the ability to scan directly from the printer to a network folder, scan to email and scan to SharePoint. These shortcuts are handy as you place the PageWide in walk-up situations. In addition to these shortcuts, you can also walkup and retrieve and print jobs – directly from a USB and from cloud services. General Office Mode is nothing short of incredible. When printing in the fastest mode, its sort-of like watching to a machine gun fire as the pages come out so quickly (but not as loud). And the quality of the print in General Office mode is still very high quality – not at all what you would expect of a ‘draft’ mode. This is why HP doesn’t refer to this as draft mode – because there is nothing draft about the quality of the print. Scanning, in particular duplex scanning, is much improved on the PageWide Pro 577dw. 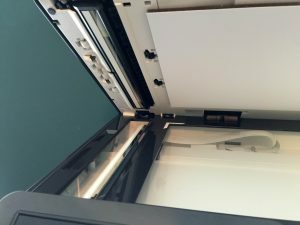 The addition of a second scan bar for the document feeder allows for a single pass duplex scanning and also allows for the profile of the document feeder to be slimmed down. The duplexer required in the OfficeJet Pro X 576dw is no longer needed with a second scan bar. This provides up to 5x faster duplex scans without the worry of paper jams due to a cleaner paper path. Print durability is still incredible in the PageWide Pro 577dw. When I reviewed the OfficeJet Pro X, this was one of the remarkable things about the ink system and the printer in general. The paper would deteriorate under water before the ink would run, particularly with Colorlok paper. I posted about this and even included a video and in testing, this still holds true with the PageWide Pro prints. As I wrote about back in 2014, the PageWide Pro is a greener alternative to printing, consuming much less power that the laser printer counterparts and also producing less waste than that of many other printers – both laser and inkjet. That tradition continues with the PageWide models. The consumables for this printer only include the cartridges and a waste tray. Comparable laser printers have bulkier toner cartridges with more plastic, fuser kits that have to be replaced during the lifecycle and they consume 50% more energy than the PageWide Pro models. The PageWide Enterprise models ship with HP SureStart and FutureSmart firmware capabilities along with integration with HP Flow and other enterprise features, but this doesn’t mean the PageWide Pro models are lacking. From a networking perspective, the PageWide Pro supports every major computing platform – from Windows to OS X, iOS and Android in a variety of ways. The PageWide Pro also includes support for 802.1x, SNMP and other enterprise requested features, so it can fit comfortably in a small home network, a branch office, or medium sized business all the way up to the enterprise network. 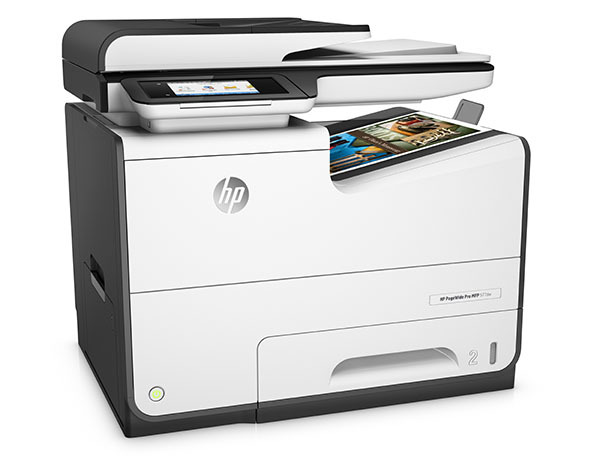 HP is positioning the PageWide lineup between the OfficeJet and LaserJet models. It has compelling DNA from both lines – sharing similar form factors and enterprise-ready features from the LaserJet line and combining those with the economies of ink and a more compelling price point. Below is a lineup for HP’s business printing options and where the company positions each brand. The times reported include the initial wake-up/warm-up time, once the print job is submitted, until the last page hits the output tray. If this time is removed, these ppm ratings exceed the ppm rating from HP Inc.
HP expect the PageWide Pro 500 series printers to be available in April, 2016, with a starting price of $699. In addition to the PageWide Pro 577dw multifunction printer, a PageWide Pro 552dw single function printer will be also be available. Disclaimer: HP Inc. provided the HP PageWide Pro 577dw at no charge for me to review. The views and opinions I share here are my own and were not previously reviewed or dictated by HP. What is Composable Infrastructure and where is it targeted?